Our track through West Nusa Tenggara. Click on areas of the map to go to that webpage. 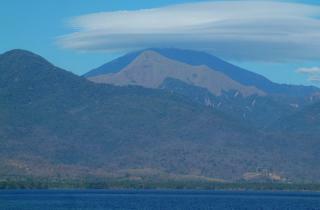 Major islands: (from the east) Sumbawa and Lombok. Other islands include: Pulau Banta (east of Sumbawa), Pulau Medang and Gili Lawang (north and west of Sumbawa). 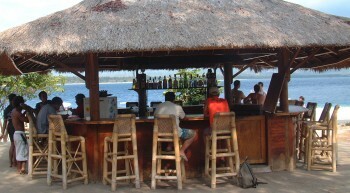 To the north of Lombok is Gili Air (and all the "Gili" islands). Population: Sumbawa is divided roughly into 2 ethnic groups: the Sumbawanese of the west (closely related to the Sasaks of Lombok) and the Bimanese speakers of the east. The peoples of Lombok are about 90% Sasak, with their own language and customs. A small minority are Balinese (Hindu). Religion: Islam. 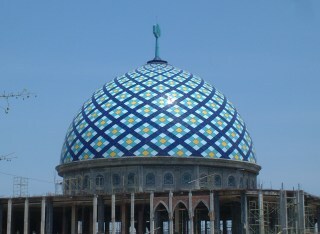 Sumbawa is the largest predominately Muslim island east of Java and Sumatra and the largest concentration of Muslim population in all of Nusa Tenggara (East and West). 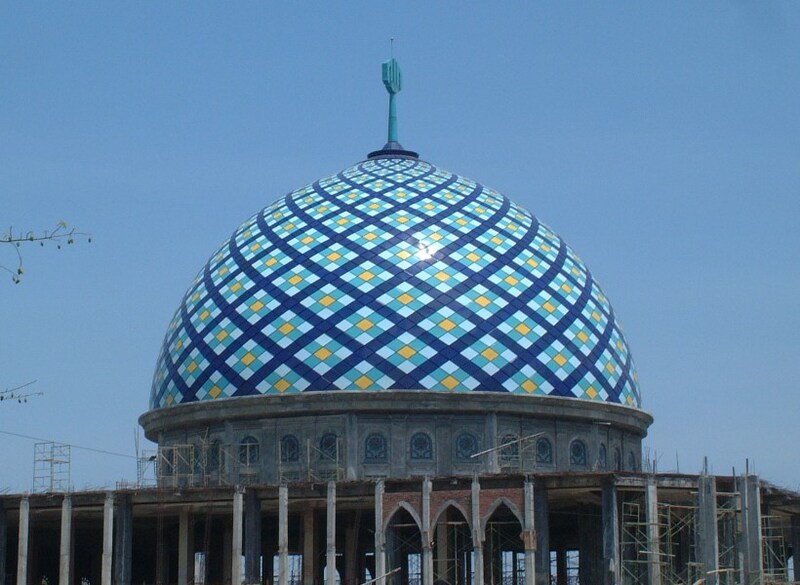 Islam is the predominate religion of Lombok (70%), with Hinduism (practiced by the minority Balinese-descended people on Lombok) and Christianity making up the other 30%. Landscape: Sumbawa is mountainous with a convoluted shoreline, deep bays, and large peninsulas that isolate small communities. Lombok, though round and compact (only 80 km in diameter) has extensive agriculture, lush forest, surprisingly dry areas, and Indonesia's second highest active volcano, Gungung Rinjani, at over 3700 meters (12,000 feet). The Gili islands offshore of Lombok are low and sandy with white beaches and palm trees. 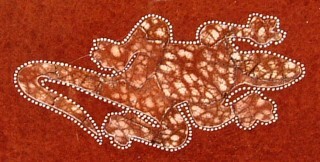 Visited: 2 September through 17 September, 2006. History - Sumbawa: Sumbawa came under the notice of the traders from Java centuries ago, with its forests rich in commercial-value timber. But it was the Islamic states of southern Sulawesi (north, across the sea) that most radically changed life for the native peoples of Sumbawa when they invaded in the early 1600's, converted the population to Islam, and subjugated the population. Although the Dutch intervened in the late 1600's, it wasn't until 1900 that they took direct control of the area. The disastrous eruption of Gunung (Volcano) Tambora in 1815 killed over 10,000 people and decimated the agriculture and livestock. The Dutch government sent people to re-populated the region, giving Sumbawa the very diverse ethnic mix it keeps to this day. The sultans of the region retained some power under the Dutch, but lost their titles after independence. Lombok: The original inhabitants of Lombok are known as the Sasak and until the mid 1700's lived in small groups that fell prey to the invading Balinese from the west. 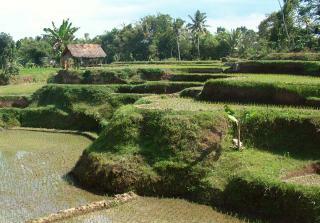 For over a hundred years the Sasak lived as serfs and peasants under Balinese rule until they appealed to the Dutch in Bali in 1891. Rebellions followed, but the Dutch were able to subjugate the Balinese rajah, and together with the Sasak aristocracy ruled the island. To this day, the Sasak view the Dutch as liberators of Balinese oppression. After Indonesian independence, Lombok was made part of the region of West Nusa Tenggara. In 1965 hundreds of communists and ethnic Chinese in Lombok were murdered in riots following the purge in Jakarta. The island saw some growth with the economic reforms of former president Soeharto from the 1970's to the 1990's, and a fledgling tourist economy grew. But the 2002 and 2005 bombings in Bali (which is the tourist link to Lombok) virtually killed tourism on the tiny island. For more info and photos read our newsletter "Beautiful Bali" the first half of which covers Sumbawa, Lombok and Gili Air. For underwater enthusiasts, see our Diving Indonesia page, specifically Pulau Banta and Gili Air Home Reef. (Amanda) I didn't really pay much attention to Sumbawa as we passed it quickly, usually just putting the hook down for a night and moving on the next day. I was still reveling in the great diving we'd done in Komodo National Park, and anticipating the much-talked-of Bali. But when we got to Lombok, I snapped out of it and started enjoying the here and now. All dressed up, Lombok style! We got an awesome private day tour in Lombok. 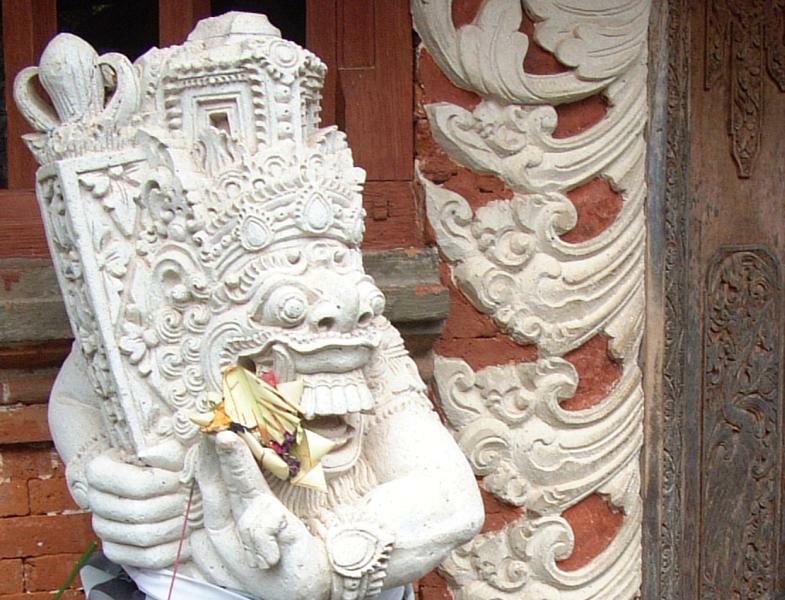 Entire villages dedicated to one craft are almost mind-boggling to imagine. We passed one displaying every type of furniture conceivable, all made with rattan and bamboo. Others that we visited made beautiful pottery or intricate ikat and songket weavings. For those villages, their craft was more than their livelihood, it was their life. If a woman at the latter village couldn't weave, she couldn't get married, she couldn't help support the village (all the weavings were sold by the village, for the village) and she would basically be a hanger-on until she learned or left. However, at the two villages we stopped at they were happy for us to take a look around and even participate. At the pottery place, a woman guided me to make a bowl on a hand-turned stone wheel, using fingers and an old cloth to shape it. 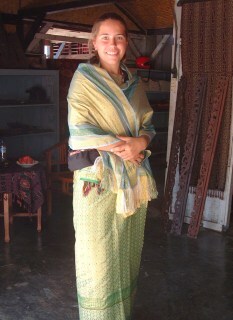 At the weaving village, they draped us in traditional songket as if for a ceremony. It was hot under all those layers! There were some interesting signs of entrepreneurship all over the island. As we drove along a river, the road on either side was piled with varying sizes of rocks. Our guide said the people living there took rocks from the river, broke them up to different sizes, and sold them as building materials. Some shops we later dubbed "mosque-top shops" -- they sold every possible chrome, silver or tile addition to a mosque or shrine that you could want, especially the onion-shaped domes that seem to be like steeples to the Muslim world. We saw these shops more in Bali, but here we got the first introduction to them. We stopped for lunch at a wonderful restaurant overlooking rice fields, and we got to walk down through them as the cook slaughtered a chicken for our curry. It was by far the best Indonesian meal we'd had yet, with a wonderfully flavored chicken curry, yummy satay with peanut sauce, and (if I remember correctly) a nice mild cap cay. 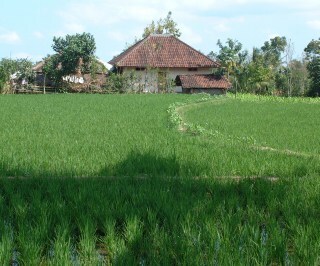 Rice fields of highland Lombok. Of course then we went to Gili Air, where we found more wonderful food. Mom and I (along with several other cruisers) actually took a one-day cooking class at our favorite beach-restaurant there, making lunch for all the husbands/fathers who had not attended and having a massive midday feast. Also on Gili Air we were able to participate in International Coastal Cleanup day, and do a free clean-up dive off the coast of Gili Air. Very cool! (Sue) My favorite thing in this part of Indonesia? Wow. It's too varied to say, really. We seemed to sail from the seventeenth century into the twenty-first century in a couple weeks! 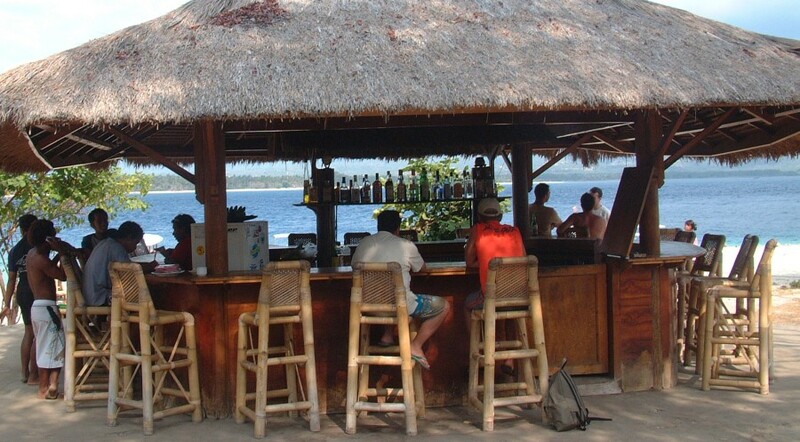 I loved the diving, of course, and the culinary adventures on Gili Air. The inland tour of Lombok especially stands out in memory. We arranged a private tour (our family only) through Mohammed, the "yachties' friend" at the Lombok anchorage. With an air-con SUV, driver and English-speaking guide (Mohammed's brother) we made a huge loop around the southern part of Lombok. We had perhaps our best Indonesian lunch so far, high in the hills surrounded by rice paddies and tobacco fields. I especially loved seeing the local pottery, made from dark red clay and decorated by intricate etching and, surprisingly, with broken egg shells. The results were unique and beautiful. Unfortunately, pottery is not something we can keep on the boat. Our friends on Estrela did a tour a few days later and ordered pottery to be shipped to the States, but it all arrived broken. The idea that a whole village dedicates itself to one craft was very interesting. 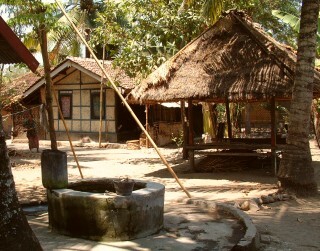 The village well in the weaving village. At the weaving village a young Muslim woman took us around through the bamboo and thatch homes of her family and neighbors. Most houses had a "barn" section which housed the cows and ponies. There was a communal well in the center of the village. She let us poke our heads into the simple homes where we saw mats on the floor, a TV -- ubiquitous in Indonesia -- and stereo. On the porches or main room we watched women sitting on bamboo floors, legs outstretched, working their back-strop looms (see "Beautiful Bali" for photos). The women in this village made the beautiful, fine songket fabrics with (traditionally) gold or silver threads. The men of the village wove the coarser ikat for everyday use. A girl starts to learn to weave at about 10 years old, and by age 16 or so, she must have finished three major textiles: the songket for herself as bride, her groom-to-be, and her mother-in-law-to-be. 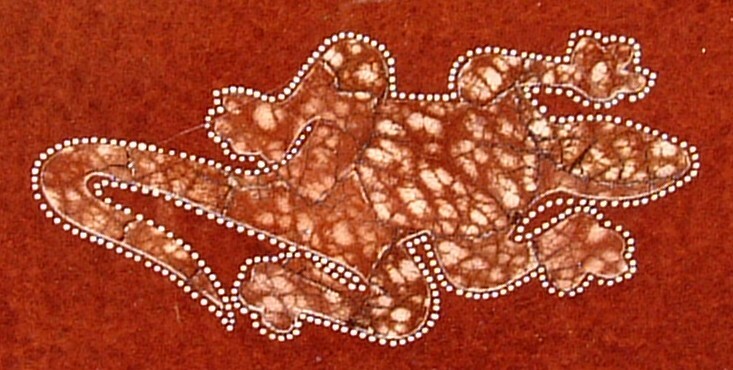 Any girl that does not complete the fabrics, or who does not learn to weave, cannot marry and leaves the village. When not weaving, the villagers were tending the cows and ponies, working the cotton fields, mixing dyes (sometimes still using roots and leaves) and dying cloth, or tending the cooperative store. We were happy to buy fabrics at a place that shared the profits among all the villagers and not just the shop owners. Our bare-headed young Muslim guide said that only the "fanatics" wore head scarves, and that on Lombok all Christians, Muslims and Hindus lived together as brothers and sisters. It was a refreshing and heartening attitude. (Jon) Our first Sumbawa anchorage after leaving Komodo National Park was a fairly open roadstead marked on the charts as Wera Bay. Rather than being one of the more common subsistence fishing villages, Wera was a boat-building village. Sitting on the beach were no fewer than 6 huge boats being built (although none were actually being worked on the day we were there). These were not the spindly little trimaran "spider-boats" we were used to seeing, but 100 foot (30m) long monsters, with hulls curving 30 feet (9m) above the keels and bowsprits reaching up almost 15 feet (5m) above that. But the truly amazing thing about these boats was that they were being built using essentially no metal fastenings at all! 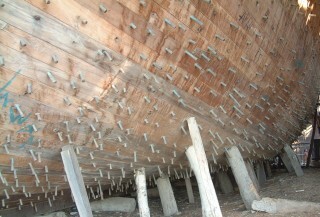 Thick hull-planks were attached to the curved ribs inside using thousands of dry-fitted pegs - not even any glue! - painstakingly hand carved and the holes hand drilled. Now and then, when the wood had dried a bit, the pegs would be driven in a bit further. 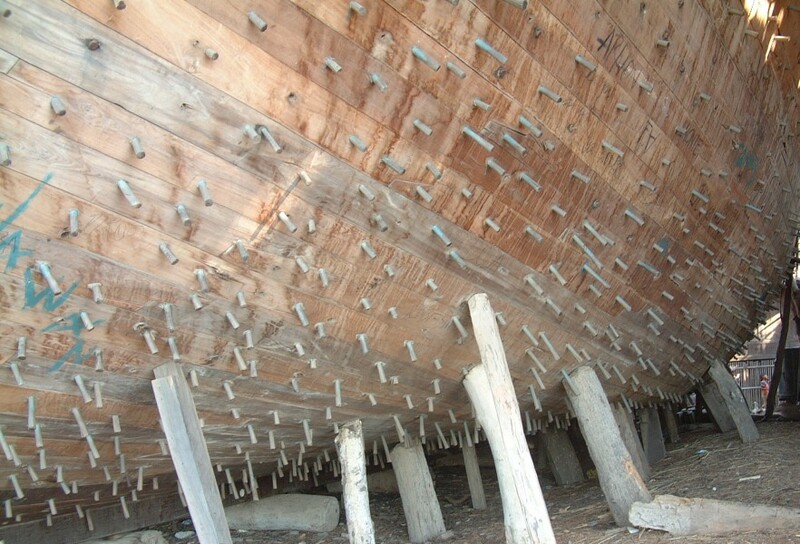 When the boat was launched, the pegs would swell from the water and hold everything together securely. Wera was one of the more affluent villages we visited (which isn't saying much) but we were disappointed to find that they didn't seem to have a problem stealing from the yachts. After the kids paddled out to say hello we found we were missing some trivial items from our bathrooms (who would reach in and steal a toothbrush?) but others lost more important yachting gear. They actually caught the perpetrators red handed and then patiently tried to explain to them why it was wrong. Islam is supposed to have rather strong anti-theft values, but perhaps the locals felt those rules don't apply to yachts or foreigners. This, of course, sets a bad precedent and undermines the values of any religion or value system. If we'd stayed there a bit longer, we might have found the village elders and talked it to them. From Wera we moved pretty quickly, covering over 200 miles and arriving in western Lombok after only 5 day-sails. I'm sure there were interesting things to see along that stretch, but we chose instead to make our own fun with the 3-4 boats we were cruising with, so we tended to keep to the more remote anchorages. 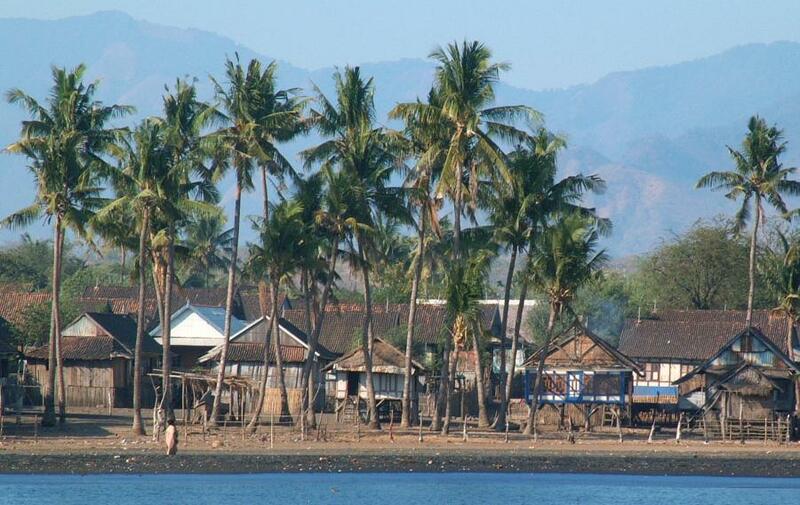 At the western end of West Nusa Tenggara, just offshore of Lombok, is a delightful little island called Gili Air. When we first got there, the rather small anchorage was full of other rally boats, so we continued on to Pamenang to do a wonderful tour of central Lombok (described above). After that we got some fuel and did some fun reprovisioning of fruits and vegetables at a local market. By then the Gili Air anchorage had opened up somewhat so we motored over. The western half of the island is a local village and the eastern half is given over to tourism, but there weren't many tourists there besides a few yachties. Gili Air was the first place we visited in Indonesia that was really setup for taking care of foreigners, and they did a very nice job of it. Lots of delightful little restaurants along the beach serving fresh seafood and amazing Indonesian curries while we sat on covered platforms above the beach. Massages were only $5/hour on covered platforms with the gentle ocean breeze wafting in. Brightly decorated horse-carts waited to take us around the island. Sue and Amanda even took a cooking class so now we have those tasty curries on board! Truly a delightful respite before jumping into the hustle and bustle of Bali.